This past weekend on RapGenius, I uploaded and began annotating Jourdon Anderson's letter to his old master. In 1865, Anderson, an ex-slave, dictated a letter to his former owner informing him of the conditions necessary for him to return to the plantation after having gained his freedom. The letter exudes wit, humor, and an early proposition for reparations or at least back-pay. 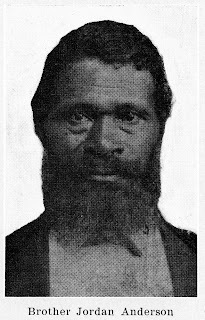 "Although you shot at me twice before I left you," notes Anderson, "I did not want to hear of your being hurt, and am glad you are still living" he informs his master, who had apparently sent a letter requesting that the former slave return to the plantation in Tennessee. I served you faithfully for thirty-two years, and Mandy twenty years. At twenty-five dollars a month for me, and two dollars a week for Mandy, our earnings would amount to eleven thousand six hundred and eighty dollars. He closes the letter by saying "Say howdy to George Carter, and thank him for taking the pistol from you when you were shooting at me," and then signs off "From your old servant, Jourdon Anderson." The letter is fascinating to read and has been enjoyable to annotate. In addition to providing brief explanations and links to key words, phrases, and passages, I have added images in places throughout the piece to further enhance the document for the benefit of modern-day readers such as my students who I'll cover Anderson's letter with this fall. Wow! I didn't know something like this existed. The REAL Ex Slave Credo. I wish I knew about this a little while ago.